I don’t post a lot, but I figured you guys would appreciate the car. Flex fuel setup made 505 whp on E85. This is what’s referred to as an “Aussie Pursuit” race. They use our times from the day before to figure out how long it should take you to run 25 laps and then handicap you at the start. 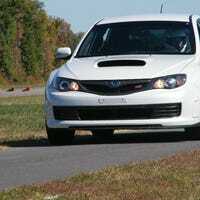 Should I sell my STi??? I've got a predicament. I love the car, but I daily drive my truck and I race the Spec Miata. I'm thinking about making some HNBAS shirts to help fund my Spec Miata racing. Good idea or terrible idea? I went to Mexico and they have neat cars!!! Holy crap. There's a new Z06 at my track day. And I'm trying to mobile kinja. But fail so far. I went fast. I turned left. I like this thing. Video to follow. I've gotten the car all but ready to go. A few more small items and it will be time for track days and competition school. I am from the road racing Mecca of America, potentially even the world... Paducah, Kentucky. HNBAS is now officially HNBAS Racing. I bought a Spec Miata. Old School RWD and a Gravel Pit. This is basically how I spend boring Fridays.